Liquidation Limits - Where to view liquidation limits and how they may cause artificial shortfalls in the cash flow forecast – Have a question? Liquidation limits could cause artificial shortfalls in the cash flow forecast. If you do decide to limit liquidations on an otherwise liquid asset, such as a bond or unwrapped investment, do be aware that such limits may cause artificial shortfalls in the cash flow. 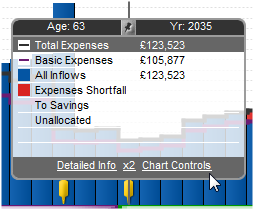 If top-up income were needed in the future after all other liquid assets are depleted and funds are available in the bond but the software is not allowed to withdraw them due to a liquidation limit you have set on the account, the software will show the available liquid asset even in years when shortfalls are occurring. Liquidation limits can be seen on the Let’s See chart details panel, Investments tab. If the Withdrawals column shows a limit, which in this case is £0, indicating that withdrawals are disallowed altogether, whereas the investments has allowable withdrawals (shown here as being £500,000), then an artificial withdrawal limit is being imposed on the investment and is skewing the cash flow, creating shortfalls in years where ample funds may be available.